The first blood moon of the 2014-2015 tetrad has occurred, as people looked on in awe. I couldn’t see it myself because of the overcast sky in Houston last night, but there are plenty of pictures circulating the Internet to satisfy my curiosity. I’ve included some below. This article is a follow-up to yesterday’s article and is quoted from the Fox News site. The moon took on an eerie blood-red hue early Tuesday during the first total lunar eclipse of 2014, a celestial sight that wowed potentially millions of stargazers across North and South America. 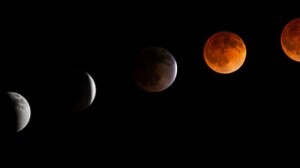 The total lunar eclipse of April 15 lasted about 3.5 hours between late Monday and early Tuesday, with the Earth’s shadow slowing darkening the face of the so-called “Blood Moon” in a jaw-dropping sight for stargazers willing to stay up extra late or rise super-early for the event. The lunar eclipse peaked at 3 a.m. ET, with the moon taking 78 minutes to pass through the darkest point of Earth’s shadow. It was visible from most of North and South America, Hawaii and parts of Alaska. The eclipse was the first of four consecutive total lunar eclipses, known as a “tetrad,” between April 2014 and September 2015. Astronomer Bob Berman, who hosted a live lunar eclipse webcast for the Slooh community telescope using views from Arizona’s Prescott Observatory, said event was also one for the record books because of another bright object in the predawn sky. “It was the most special one, I would say, of our lives,” Berman said during the Slooh webcast. “What made it particularly extraordinary was that it happened on the same night as the closest approach of Mars to Earth in years.” Mars made its closest approach to Earth since 2008 on Monday night (April 14), coming within 57.4 million miles of our planet. So the Red Planet and the “Blood Moon” shined together in the predawn sky in a rare event, Berman said, adding that the bright blue star Spica completed the show. Finish this article here: http://www.foxnews.com/under-blood-moon The first blood moon has passed with three more to go. If this is a signal from God, remember that in previous tetrads, the ‘significant change’ came after the tetrad, not at teach eclipse. If it’s just a coincidence, that does not negate the Word of God or his power.